Today I want to talk about the future of the glitter powder. 1.In 1934,thanks to the father of glitter powder,in New Jersey,a Machinist named Henry Ruschmann of Bernardsville, invents a new way to grind up plastics to make large quantities of glitter. He founded Meadowbrook Inventions, and today still is a major supplier of the glitter. But at that time the raw material is mostly PVC,PVC is short for Polyvinyl chloride. Soon many companies used PET glitter instead,why we can call PET glitter eco-friendly. Why?PET is short for Polyethylene terephthalate,which only have Carbon hydrogen oxygen in PET ,that is to say,PET glitter will degradable into 3 kinds of ingrdents in the future.But today still many companies are using PVC glitter as well. 3.Few years ago,our company pays a lot of energy and money on the invention of biodegradable glitter.Finally,after years of hard work,our company finally produced the biodegradable glitter. Scientists found that microplastics have been found in human stools for the first time, suggesting they may be widespread in our food chain.More and more countries pay a lot attention on microplastics. What the world will be if we insist on BIODEGRADABLE glitter. So think about your children,think about your family,we need change now.Consumers are paying more and more attention on the planet,on their health ,on their children. One of the largest partner of Walmart had received our samples and decided to launch some new productions of biodegradable glitter shakers. 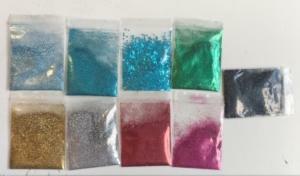 One of the largest resin polishing company in USA decided to change all glitters to biodegradable glitter. 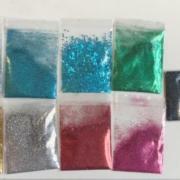 Many distributors/wholesalers in UK /Europe/USA/ decided to change their business from PET glitter to biodegradable glitter. Think what it will be in the 5 years or 10 years,we need your help us to low down our cost of the biodegradable glitter and we will help you to expand your business. Please see my article 5 years later and see the world again.